Gothenburg Hotel Guide - from exclusive hotels to low budget hotels. There are many different types of accommodations in Gothenburg. From Youth hostels to luxury Hotels. It will be your wallet that decides were you shall stay. Below you can search for a hotel in Gothenburg. Below we list some of the Hotels in Gothenburg! Search for a Hotel in Gothenburg via the search square above or click on resp. Hotel or the link "Reservation" were you also can reserve a room. Opens Jan 26, 2012. Gothenburg's newest hotel, and perhaps most luxurious. In the old post office house this fantastic hotel now opens. Restaurant with cuisine by Marcus Samuelsson and a roof-top pool. 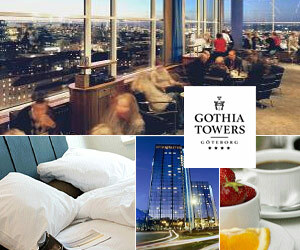 Stay at the Gothia Towers! Scandinavia's largest hotel with its 23 floors. And a fantastic view over Gothenburg. A perfect location for you who visit the Gothenburg Horse Show, Melodifestivalen, TUR2010, or just wish to relax for a weekend. Kungstorget 9 (Beside Saluhallen & Kungsportsavenyn) Opened July 2007. A feng shui-certificate Hotel with 101 rooms in the centre of Gothenburg. Choose between 6 different categories of rooms (Penthouse Svit, Svit, Deluxe, Superior, Business and Moderate). Here you will find a restaurant, bar and wine room. A roof top terrace with a pool. Conference room. Suitable for the disabled. Kungsportsavenyen 6 Eco hotel / POPULAR The Hotel is located at the famous street Avenyn. You will stay in the middle of the centre among restaurants and stores around the corner. Close to Götaplatsen, Liseberg, Stora Teatern, Lorensberg etc. Children under 12 years old stay for free. Olskroksgatan 23 Eco hotel Built 1897 and is located just outside city centre. The Hotel is not far from the square Olskroken. Access to Sauna. Good public transportations to the city centre. In the house you will also find the very famous restaurant, Tidbloms. Stora Badhusgatan 28 Located not far from the canal and the street Kungsgatan is just around the corner. There you will find a fiew restaurants and stores. Not located in the city centre but with a fiew walkings steps you will reach many interesting things in town. Kungsportsavenyn 36-38 POPULAR The Hotel is located at the famous street Avenyn. You will stay in the middle of the city centre with restaurants and shops. Close to Götaplatsen, Liseberg, Stora Teatern, Lorensberg etc. Access to Sauna. Västra Hamngatan 3 This Hotel is built 1889 and the interior has the original stucco decorations in the ceiling and mosaic floor. The Hotel is located close to Kungsgatan. On the walls you will see modern art. Access to gym and sauna. Children under 12 years old stay for free. Utlandagatan 18 (Between Eklandagatan and Mölndalsvägen) Familyown Hotel located a bit outside the city centre, close to the area Johanneberg. Close to l Liseberg, Universeum and Svenska Mässan. Good public transportation to the city centre. Children under 4 years old stay for free. Nils Ericsonsgatan 23 POPULAR Located just beside the big shopping centre Nordstan and just 50m from Central Station. Not far from the street Avenyn and just a short way to the Square Gustav Adolfs. Access to spa and sauna. Nils Ericssonplatsen POPULAR (Gothenburgs Central Station) The Hotel is located above Central Station in the middle of the city. Very close to the shopping centre Nordstan, the Square Gustav Adolf and Trädgårdsföreningen. Access to gym close by. Södra Hamngatan 59-65 Located just opposite of the Central Station. Walking distance to Avenyn, the shopping centre Nordstan etc. Access to pool, gym, sauna, solarium etc. In the same building you will also find some different stores. Sten Sturegatan (Heden) A charming Hotel that is located in the city centre at Heden. If you stay here you will also get free entrance to the Amusement Park, Liseberg. Close to Liseberg and Avenyn. Restaurant Heden in the Hotel serves swedish food and also international courses. Kungsportsavenyn 24 The Hotel is located at the famous streetAvenyn. You stay in the middle of the city centre with restaurants and stores at the street. Close to l Götaplatsen, Liseberg, Stora Teatern, Lorensberg etc. The children have their own room were they can eat breakfast and look at videos etc. Cosy restaurant and Bar at the main floor. Norra Kustbanegatan 15-17 The Hotel is located a little bit outside the ciy centre. The Hotel is located approx 0.3 miles from the Stadium Ullevi. The amusement Park Liseberg is located approx 6,2 miles from the Hotel. At summertime you can visit their outdood terrace on their roof. Access to gym, sauna, billiards etc. Smokefree Hotel. Karl Johansgatan 66-70 The Hotel is located a bit form the city centre. Good public transportation to the city centre. Approx 2,4 miles from Liseberg, Götaplatsen etc. Smokefree Hotel. Children under 6 years stay for free. Södra Hamngatan 2 Located in Brunnsparken near the Central Station. Walking distance to the Avenue, Paddan boats, Gustav Adolf Torg, shopping center Nordstan etc. Cozy rooms in one of Gothenburg's most beautiful house from the 1700s. Breakfast buffet is included. Hotel Robinson - "In my recent trip to Goteborg, with my sister and cousin, we stayed at the Hotel Robinson. We had been told and found out, that it would be difficult to get a room for three. When I e-mailed the Robinson, she answered immediately that she had a room with or without a bath. We chose with a bath, and were most pleased with the room. The room was clean and spacious for all three of us, even including a little sitting area. We were there three days and fount it to be in the center of everything. The breakfasts were wonderful as was the staff. I would recommend the Robinson to anyone." Stora Badhusgatan 26 Located a litte bit from the canal. Not far to Casino Cosmopol and just a bit longer away you will find the Opera House. Behind the Hotel you will find Kungsgatan with restaurants, stores etc. Visit their sky Bar and see the nice view over the harbour. Smokefree Hotel. Mässans Gata 24 (Liseberg) The Hotel is 75 feet high and is located opposite of the amusement park Liseberg. Their Bar at the top floor is famous for their tasty scrimp sandwiches and also their nice view over the the city. Access to Sauna. Close to Avenyn, Svenska Mässan and Scandinavium. Eklandagatan 51-53 The Hotel is not far from the city centre. Close to Liseberg and Svenska Mässan. Access to Sauna and Spa. Their Bar is famous for their long drink list. Children under 5 years old stay for free. Koepmansgatan 38 POPULAR The Hotel is located just beside Central Station. Close to l Trädgårdsföreningen and to the shopping centre Nordstan. Access to Gym and indoor pool. Close to the Central Station. Klippan 1 The Hotel is located by the canal with a nice view over the ciry harbour. The Hotel is not located in the main city centre. Children under 16 years old stay for free. Access to sauna, bar and roof terrace. A small distance to walk to public transporatations. Maskingatan 11 (Hisingen) The Hotel is located at the Island Hisingen, very beautiful located close to the canal. You stay by the water and some rooms have a nice view over the city harbour. To get to the city you can take the ferry over to the other side, a really nice trip. Some restaurants is located beside the Hotel. Spa and Sauna. Children under 12 years stay for free. Gamla Tingstadsgatan 1 (Hisingen) The Hotel is located at the Island, Hisingen. The Hotel is located beside the Higway E6 to Oslo. Good access with the car. Approx 1,8 miles from the city centre. Access to Sauna and indoor pool etc. Restaurant. Children under 12 years stay for free. Search for available Youth Hostel and budget stay in Gothenburg. Use the search square below to search for available dates. Find all hostels in Goteborg! There are many Youth Hostels in Gothenburg. Some are located in City Centre and some outside the town. By us you can book the Hostels below. Stay cheap in the great natural beauty outside Gothenburg. Choose beween a room with 1 person or up to 6 persons in a room. Breakfast and access to the pool is included in the price. Stay cheap in the city centre with the nearness to everything. Choose between Choose beween a room with 1 person or up to 6 persons in a room. Stay in a historic house from 1854. Previously this was a sailors house. 2-8 bed rooms. Internet. Some budget alternatives in Gothenburg. Close to Liseberg, Avenyn, Universeum. Close to Avenyn & Liseberg. Close to Central Station, Ullevi & Liseberg. Close Ullevi, Central station, Scandinavium. Rent a room in a private apartment. The price includes bed linen and towels. Internet. Non-smoking. No children under 13.